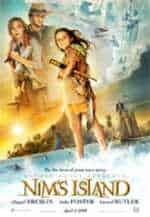 Nim’s Island astonishes and amazes as a fascinating movie for kids just for the fact alone that it advocates in its own whimsical way, that there’s lots more to life than consuming toys, cell phones and gadgets. How about for starters, getting a thrill out of bonding with nature, and being fired up with sheer wonder over reading a book. Husband and wife team Mark Levin and Jennifer Flackett (Little Manhattan) co-direct this adaptation of Wendy Orr’s 1999 novel with a keen eye for how children think, feel and grasp the world around them, and an exceptional sensitivity to youthful joy and sadness. Abigail Breslin is Nim Rusoe, a child being raised in an extra-large treehouse on a remote Pacific island by her scientist dad Jack (Gerard Butler) after her mom was apparently swallowed by a whale in the surrounding waters. Proud of her own ‘perfect secret world’ all to herself, along with being home schooled, or rather island schooled, Nim spends her days exploring nature, reading adventure stories, and socializing with the local wildlife, including her best friend, Iguana Fred. But one day when Jack goes out boating and disappears during a violent storm, Nim finds herself home alone. That is, until the San Francisco writer of her favorite books, Alexandra/Alex Rover (Jodie Foster), emails the precocious kid’s father (yes, there is by chance the Internet up in the treehouse) to do some research for her next wilderness tale. While Nim mistakenly believes she’s communicating with the brave world explorer Alex that she’s been reading about avidly in Rover’s books, Alexandra/Alex for her part thinks she corresponding with Dad. When Alex finally figures out that Nim is stranded on the island by herself, she’s determined to pack her bags and go protect the child, while helping her to find her father. The hitch is that Alex is a deeply neurotic borderline agoraphobic, basically fearful of everything, who hasn’t left her house in a couple of weeks. And much like her new online best friend Nim, despite their age difference, Alex embraces the hermit lifestyle, as far as possible away from society. So Alex’s biggest problem in embarking on her journey to the far off Pacific island, is figuring out how to get past her front door. Offering a tremendous amount of impatient tough love encouragement is the main character of her stories, Alex Rover (Gerard Butler once again), her imaginary confidante, creative inspiration, conscience and emotional crutch. Meanwhile, Nim’s got some issues of her own back on the island, like concocting all sorts of mean but highly imaginative strategies to rid the island of an invading travel outfit trying to turn her very personal space into a tourist trap. Which includes releasing airborne reptiles as pretend fiery dragons on the encroaching tourists. To say more about Alex’s excellent adventure to find Nim, would spoil much of the fun. Suffice it to say that Jodie Foster makes a quite surprising and extremely effective leap from the repugnant race-baiting serial killer she last played in The Brave One, to a fine back-to-nature, bumbling comic actress, warts and all. But she’s still pretty mad at the world, though this time around it’s less about the bad things people do, than how unsanitary their germs make the planet. And when finally able to split from that split personality annoying figment of her imagination Alex, Jodie isn’t half bad at dining on worms or playing soccer with a coconut in the wilderness either.